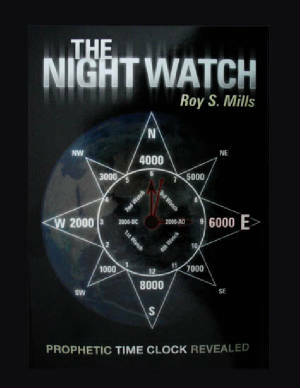 A Prophetic Time Clock is revealed within the four time frames of The Night Watch, a Hebrew custom to guard against enemy invasion. This revelation portrays Jesus Christ as the dividing factor between two 4000-year periods. The introduction of Jesus Christ to the world literally split time into two eras: BC and AD. This book confirms the voice of the prophets and the signs of the times. Each chapter demonstrates an incredible parallel between natural and spiritual events. The Prophetic Time Clock reveals that three watches have now been fulfilled. We are entering the fourth and final watch concerning God’s plan of redemption. A far greater picture is now visible to the 20th century Church. Roy said, “The Night Watch confirms the convictions of many today concerning the imminent coming of Christ.” The night is truly far spent and the day of the Lord is at hand! (Rom.13:12)Roy believes God’s alarm is about to sound on the Prophetic Time Clock. It’s wake up time for America and the nations of the world. We are entering the darkest hour in human history and the most glorious hour for the faithful in Jesus Christ.